Coconut Curry Chicken on your table in less than 30 minutes that tastes better than your favorite restaurant! Its lusciously creamy, loaded with flavor and super simple to make all in one skillet. 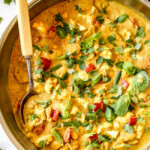 This Chicken Curry with coconut milk is made with pantry friendly yellow curry powder and customizable veggies, so you can make this easy one pot wonder any night of the week. Simple, delicious and a dinner the whole family loves – are you in LOVE?! Heat oil over medium high heat in large skillet. Add chicken, onions and curry powder and cook just until chicken is no longer pink. Add bell peppers, cauliflower, green beans, ginger and garlic, and sauté 1 minute. Add half of the coconut milk (eyeball it). Mix remaining coconut milk with 1 tablespoon cornstarch and add to skillet along with all remaining ingredients (expect Garnishes). Bring to a boil, then reduce to a simmer for 5 minutes or until the sauce thickens and the vegetables reach desired crisp-tenderness. Garnish with additional optional fresh basil, cilantro, lime zest, lime juice and chili sauce to taste. Serve with rice.